The Magsat project was a joint NASA/United States Geological Survey (USGS) effort to measure near-earth magnetic fields on a global basis. It was the third of a series of Applications Explorer Missions (AEM). Objectives included obtaining an accurate description of the earth's magnetic field, obtaining data for use in the update and refinement of world and regional magnetic charts, compilation of a global crustal magnetic anomaly map, and interpretation of that map in terms of geologic/geophysical models of the earth's crust. The spacecraft was launched into a low, near-polar, orbit by the Scout-G1 vehicle. The basic spacecraft was made up of two distinct parts: the instrument module that contained a vector and a scalar magnetometer and their unique supporting gear; and the base module that contained the necessary data-handling, power, communications, command, and attitude-control subsystems to support the instrument module. 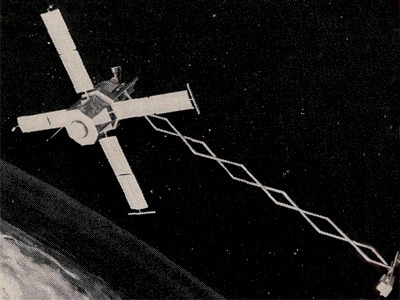 The base module complete with its subsystems was comprised of residual Small Astronomy Satellite (SAS-C) hardware. The magnetometers were deployed after launch to a position 6 m behind the spacecraft. At this distance, the influence of magnetic materials from the instrument and base module (chiefly from the star cameras) was less than 1 nT. Sixteen complete vector magnetic field measurements and eight scalar measurements were obtained every second.